The Cardington FFA found the Morrow County fair to be a great place to hang out with friends and eat food but it was also a time to show and represent their chapter or club with their personal projects. 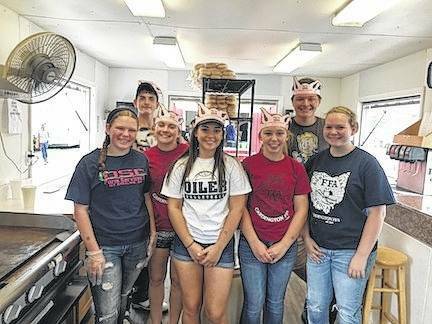 The Cardington FFA did not disappoint this year when members volunteered to serve at the Morrow County Pork Producers Booth one day and served in the Morrow County Cattleman’s booth another day. Volunteers who served in both booths had a great time serving their community. The Cardington FFA had members with projects in every barn at the fair, a majority taking rabbits while others had cattle, hogs, sheep, poultry and horses. Among those with outstanding projects were Brooklyn Whitt, with a grand champion BBR hog and Liam Warren, grand champion large poultry project. Overall, the chapter had great success this year and many members placed well in all of their shows. Liam Warren,Cardington FFA, grand champion overall poultry winner. https://www.morrowcountysentinel.com/wp-content/uploads/sites/29/2017/09/web1_Liam-Warren-3.jpgLiam Warren,Cardington FFA, grand champion overall poultry winner. Cardington FFA member Brooklyn Whitt winner of grand champion BBR hog. https://www.morrowcountysentinel.com/wp-content/uploads/sites/29/2017/09/web1_Brooklyn-Whitt-3.jpgCardington FFA member Brooklyn Whitt winner of grand champion BBR hog. FFA members who worked in the Morrow County Dairy Association booth at the fair, from left, are Chyanne Skaggs, Deven Hollis, Katelyn Denney, Maci Morgan, Heather Sparkman, Jared Haught and Kaitlyn Straley. https://www.morrowcountysentinel.com/wp-content/uploads/sites/29/2017/09/web1_FFA-members-worked-in-Dairy-building-1-.jpgFFA members who worked in the Morrow County Dairy Association booth at the fair, from left, are Chyanne Skaggs, Deven Hollis, Katelyn Denney, Maci Morgan, Heather Sparkman, Jared Haught and Kaitlyn Straley.